Short, handy and powerful enough for anything on the North America, the .45-70 Trapper is the perfect capper to Marlin’s Guide Gun concept. 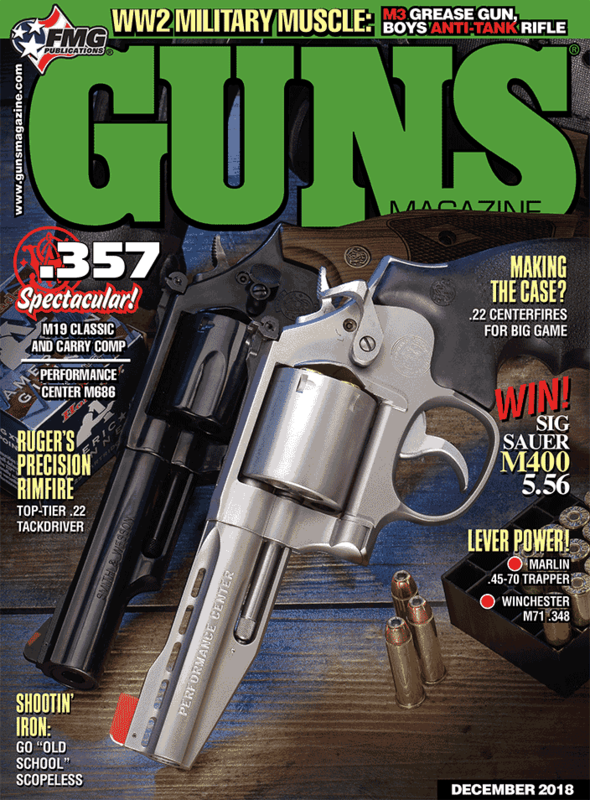 I don’t know if Marlin’s late-1990s introduction of the 1895G “Guide Gun” was single-handedly responsible for the resurgence of the .45-70 in popularity, but it sure must’ve helped. In the two decades since, the “instant classic” big-bore levergun has seen myriad variations — both factory and custom — takedown versions, big loops, stainless steel, long mag tubes, half-mag tubes, ghost-ring sights, even a new big-bore chambering or two (remember the .450 Marlin?). For many of us, however, the .45-70 is still the Belle of the Ball. The latest incarnation, the Marlin 1895 SBL Trapper, may well be the handiest and most sensible of ’em all. Featuring a 16.5" barrel as opposed to the 18.5" of the original Guide Gun (plus a compact 35" OAL), the Trapper pretty much distills every innovation visited on the original since. It’s stainless steel with a black synthetic pistol-grip stock and large-loop lever (SBL, incidentally, stands for “Stainless Big Loop”). Although no one in their right mind is going to emulate a “Chuck Connors M92 twirl” with it, it looks pretty cool and does have an advantage for gloved hands in cold weather. The rifle as issued comes with an excellent Skinner aperture rear sight and white-lined blade front. Too low-tech a sighting arrangement for you? Stick a rail on it if you feel the need for optical enhancement. Oh, one more thing. It’s got an industrial strength recoil pad, which you’ll appreciate if you’re nutty about .45-70 loads approaching low-end .458 Winchester performance (some approach way too close for my comfort). I did my share of launching hard-cast Garrett and Buffalo Bore stuff downrange back in the day, but now prefer to take things a bit easier. But then I’ve mostly used the .45-70 as a hog gun — although some were pretty big hogs, granted. This, of course, is a task for which the stodgy old Remington 405-gr. JSP is just about perfect. Or any one of several faster 300-gr. JHP loads. But I’ve heard and seen the results of guys using those stompers on dangerous stuff. And the Trapper SBL — hell, any modern M95 variant — will handle them. It’s your call as to whether your shoulder can. Mine used to. I chronographed three loads with the Trapper SBL, trying to pretty much cover the bases in terms of what’s out there in a general sense. Here’s what we got: Winchester 300-gr. JHP (1,590 fps), Hornady 325-gr. LeverEvolution (1,758 fps) and HSM 430-gr. HC Bearstopper (1,708 fps). Published velocity claims for these three indicate a loss of 290, 257 and 73 fps respectively. Yep. The shorty barrel does affect velocity. But after all, we’re dealing with a big old bullet that was never going to rival the .270 Winchester on the Richter Scale of Flatness anyway. The first two were quite comfortable, the HSM Bearstopper — as the name indicates — was on the energetic side and was least affected by the short barrel. It wasn’t unbearable (couldn’t resist that one). Just stout. HSM’s 430-gr. Bearstopper load is aptly named, and groups well — if you can beat the flinch! The Aimpoint Micro requires a rail. But it combines a reasonably unobtrusive configuration with unsurpassed quick target acquisition. Although I’m not a dedicated fan of sticking scopes on classic tube-magazine leverguns, there are other options that are kinder than iron to older eyes. In other words, it ain’t simply a choice between 19th Century buckhorns and some high-zoot variable that’ll prevent you from grabbing your .45-70 Marlin by the receiver to head off for the tall and uncut. So just to be semi-fair, we shot the Marlin with two separate sighting arrangements. The first was the Skinner setup described above. We used it at 50 yards, although its usefulness extends — at least as far as I’m concerned — to twice that distance. The second was an Aimpoint Micro that we used at 75 yards. Dialing the size/intensity of the Micro’s red dot down really makes this item an extremely effective sighting option. I managed to hit stuff on faraway berms well in excess of my paper target yardage. But what makes the Micro so useful is its absolute “look-shoot” simplicity and serious windage/elevation adjustments. Yep, it’s non-traditional and your Cowboy Action buddies may hoot a bit. But in low light it’s darn near unsurpassed for when you want to anchor something edible. Accuracy-wise, the best 75-yard performances were with the Micro teamed with the 325 Hornady and 430-gr. HSM stuff. At 50 yards, we used the issue Skinner setup and were rewarded with 1" groups using the old Remington 405-gr. JSP (unfortunately, we didn’t have enough of it to chrono, although I’d guesstimate a figure in the 1,100 fps range would seem reasonable). I’ll be straight. This is the first Marlin product I’ve shot/cycled extensively since Remington took the reins of the company. I’ve loved Marlins since I was a kid. But every card-carrying Marlin fan knows darn well there’s been some sniping over the past couple years regarding “Remlin” guns. This one? From what I saw it’s a superlative levergun, accurate, powerful and reliable. I’d shot various .45-70s and .30-30s at SHOT Show range days before and (no bolt-gun condescension intended) was gob-smacked by their accuracy. And these were under the Big Green banner. As nicely fitted and polished as a “Golden Age” Marlin like my 1951 Model 336 “waffle-top?” Well, probably not. But what is? Recently, His Editorship Roy Huntington visited Remington and chatted with them about Marlin. Roy — an unreconstructed old-school levergunner — came away impressed by the fact they’ve committed to ramping up the game there and promise “even better than the old days,” along with a few very cool new offerings. He also said what he saw there showed old-school fit and finish — so stay tuned! The bottom line? The Marlin SBL Trapper is a specialty item for those obliged to hunt in wet, heavy cover in search of hazardous critters — say Alaskan bear hunters. With 5+1 rounds of high-performance .45-70 on tap, you could do a whole lot worse.